Sectional Construction: Each piece is small enough to go through a normal door. The Shire Buckingham Summer House features lovely double doors and a large opening window (Which can easily be fitted in either side of the building during construction). 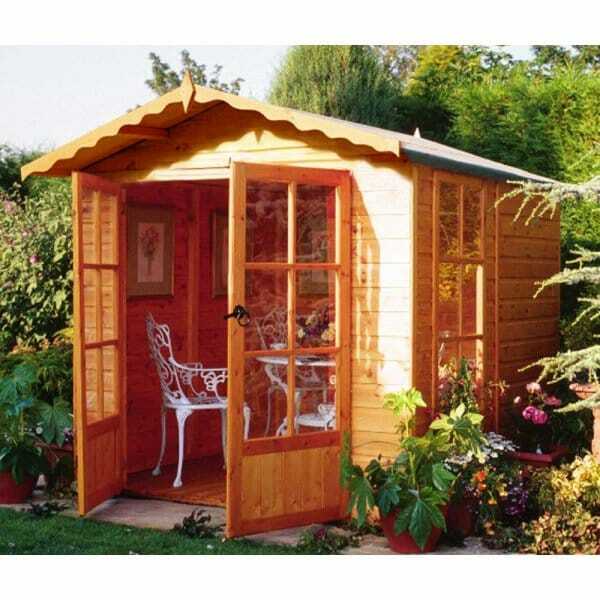 This superb value summerhouse is an attractive addition to the garden and cost wise - it very much helps with the budget! Frame: A robust Planed 35mm x 35mm Framework in walls and floor that gives the Shire Buckingham Summer House its Rigidity. Walls: constructed using high quality 12mm thick shiplap pattern boarding. All the timber used timber is from sustainable sources. Review - Ordering and Delivery were fine. The assembly instructions were very poor, could hardly read them and the diagrams were inadequate. There were even small pieces of wood missing that I had to go and buy as I needed to get it finished. Now within weeks of assembly small splits are ocurring in the wood which I have had to fill with mastic to stop water coming in. Would I buy this summerhouse again? no, most certainly not. Finished Building looks great and is a real focal point and Ordering and Delivery were fine. The assembly instructions were not great, could hardly read them as text was small and the diagrams were inadequate.